Move past broccoli, broccoli and more broccoli or carrots, carrots and more carrots. Quick, name five vegetables cooked in the last month. Can you? Most of us eat the same couple of vegetables cooked in the same ways again and again. To eat more vegetables, first get out of the rut of your own version of same-old same-old broccoli or same-old same-old baby carrots. Start by identifying just one new vegetable to try. To start online, for an eye-opener about all the many vegetables are easily available, see the Alphabet of Vegetables. But for real inspiration, visit the produce department in the grocery store and pick one whose color or shape appeals. Vegetables are quite beautiful, aren't they?! Then come back to the Alphabet of Vegetables, or search Food Blog Search for a recipe that appeals. EXTRA TIP Did you know that baby carrots we buy in the grocery store aren't 'young' carrots or even 'small' carrots at all? 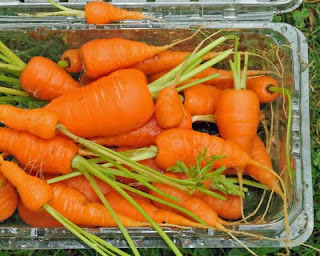 Instead, they are commercial carrots that start with huge carrots that are ground into the bullet-shaped carrots credited with increasing carrot consumption by manyfold in the last decade or so. Like many, I like them for snacking. But when it comes to cooking carrots, choose whole carrots. The trimming and peeling process will take a few minutes but for real carrot flavor, there's no comparison. AND YOU? What about you, are you stuck in a vegetable rut? Would you be willing to try a new vegetable this week? Today's photograph is courtesy of vibrant_art on Flickr. I belong to a CSA, so it's a new "vegetable adventure" each week to use up the produce at its freshest. I'm on a big brussels sprouts kick right now! yea! for veggie evangelism. i'm doing a "recovering picky eater" challenge on my blog right now. more than half the veggies i eat now, i've learned to like since i changed my mindset from "i'm a picky eater" to "i'm learning to like new things" it's never too late to learn to like onions, winter squash, raw carrots, or leafy greens. Thanks for the handy tips! From one veggie to another, it's always fun to hear how others change up their eating habits. Great tip - so true! Once you start expanding your vegetable horizons, eating vegetables becomes much more fun. Many people aren't in the habit of cooking greens (besides spinach) for example - but they are so easy to cook and so good for you.